DESC #BookBuddies Meeting One- Make it stick! The books have arrived….(finally! ), delighted to have DESC’s staff book club up and running! We currently have 3 book groups that will run parallel to each other. The chosen books for our first round are “Make it Stick” by Peter Brown etal, “Why don’t students like school” by Daniel Willingham and “The Hidden Lives Of Learners” by Graham Nuthall. From my point of view the staff book club is an exciting opportunity to discuss research regarding Teaching and Learning with my colleagues, whilst I’ve done a great deal of reading over the last 18 months or so, I’ve not really discussed or disseminated much of what I’ve read, other than via Twitter or this blog. There are huge gains to be made from engaging in up to date research and any opportunity where colleagues find the time to get together with staff from other Depts, have meaningful discussions about Teaching and Learning and develop our research literacy is a useful one! Research from the cognitive scientists has shown that the practice of interleaving and space retrieval supports memory retention in the long term. Spacing out practice and revisiting content at various points in the year creates neural pathways. Forgetting is key to building storage strength in the brain. We discussed how structuring our curriculum in this way might make learning harder and feeling like it was less productive, though it would lead to longer lasting learning. We also explored how the less able might cope with such “desirable difficulties”. 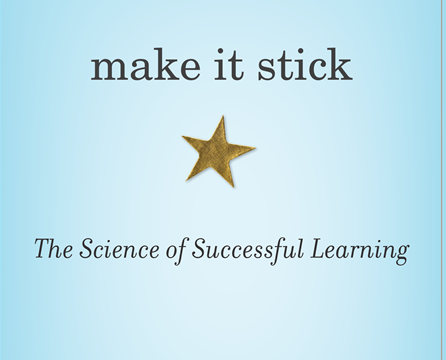 Make it stick suggests several practical strategies to develop memory/learning, more frequent testing is thought to help us remember, retrieving information from memory makes it easier to recall. Using frequent quizzing to help students to consolidate learning and interrupt the forgetting process and interleaving problem types. Sian (English), Simon (Maths) and Lottie (Science) have agreed to carry out some classroom based research by trialling these with their Year 11 groups during the Spring Term, with a view to us being able to share the impact of our findings with other staff later in the year.